Yesterday I was set to make a really boring stir fry but elected to do something a little more creative. The inspiration for this comes from watching a vast number of Iron Chef episodes recently. I feel compelled to mention, again, that this is the Japanese version of Iron Chef and not that terrible affront to the original series, Iron Chef America. Due to the vast quantities of nappa cabbage and bok choy in the fridge I felt compelled to make a very boring stir fry. I remember a time in the early 90's when stir fries seemed kind of interesting and exciting. Now it seems about as plain and exciting as making mashed potatoes. That being said, this one was pretty tasty. I browned some crushed garlic and minced ginger root in a little sesame oil, cooked down some carrot and red pepper, then tossed in the shopped bok choy and nappa cabbage. I added some rice wine vinegar, tamari, and roasted red chili paste. 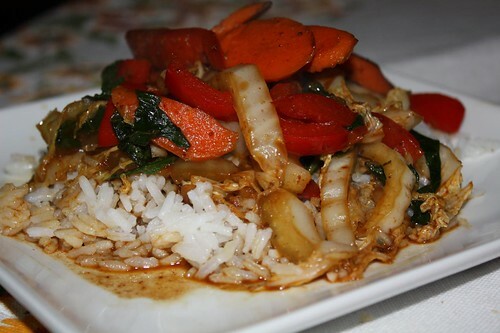 I cooked some rice in coconut milk and served the completed stir fry over the rice. It was actually far tastier than I thought it would be considering all I was doing was using up stuff I had lying around. For beer I found a fall ale that I'd somehow missed! Having sampled just about every fall beer I could get my hands on by the beginning of October, it was nice to have something new this evening. 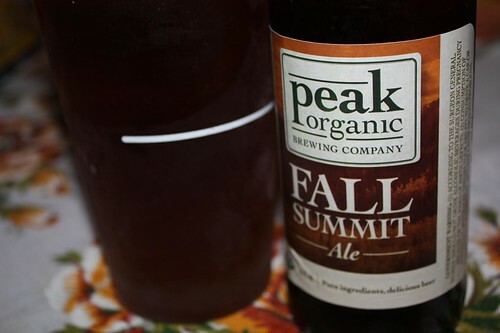 This was the Fall Summit Ale from Peak Organic in Maine. It was a great counterpoint to a spicy stir fry on a rainy evening. But not quite as good as watching Iron Chef Italian defeat the owner of a food cart.